While a great number of those that visit this page have tried their hands at overclocking, in the big picture, the overclocking population is quite small compared to everyone else. Most users either don't know about overclocking, can't overclock, or don't wish to take the risks involved. It seems as though for users like that the motherboards available to you...are...well, just about everything. However how do you narrow down the options to a few really good motherboards? How about one that truly stands out among the competition, since it isn't an overclocker's board the TMC AI6NL has no strengths other than the basics, stability, quality, reliability, and performance. Never heard of TMC? You're about to hear some great things about their Pentium II flagship motherboard, the AI6NL. Let's dig right into this baby, controlled almost entirely by Dip Switches, unlike the common jumperless setups found on most Pentium II LX motherboards, the AI6NL does feature one very important jumper which allows you to switch between both supported power supplies, AT or ATX. Usually combination AT/ATX motherboards are oddly shaped, and conform to the AT specification over the ATX specification whenever possible. In spite of this the AI6NL's layout is quite spacious, the only time it can get annoying is if you have a mini-tower case, it isn't recommended to use anything smaller than a mid-tower AT case with the AI6NL, a Full Tower being the preferred environment. Having never seen a TMC manual before, the cover was impressive looking to the least, the contents on the other hand...put the competition to shame. If we call ABIT the reigning champ of making quality user's manuals, the TMC user's manual is as close as you can get to the ABIT manual without violating any copyright laws. For an AT motherboard, TMC tried to bring all of the expansion features of an ATX motherboard to the AI6NL, however they were only partially successful in doing so, outfitting the board with 3 DIMM slots, 3 PCI, 1 AGP (between the 1st PCI and last ISA slot) and 3 ISA slots. One advantage to the extreme length of the AI6NL is the fact that all expansion slots can accept full sized cards. The motherboard itself appears to have been designed with quality and reliability in mind, making excellent use of about 22 mid sized capacitors, 4 average height voltage regulator heatsinks, and a beautiful layout, the AI6NL is a very user friendly motherboard. If this happens to be your first home built system, the AI6NL will ensure that your first experience was a pleasant one. In all tests, using both PCI and AGP video cards, the AI6NL never crashed once, with the system continuously humming and ticking away like the clock it beat consistently. Configuring the AI6NL for testing was a breeze, the written documentation doesn't provide information to a few of the other possible combinations of the bus speed dip switches, however there doesn't seem to be any support for > 66MHz bus speeds with this motherboard. The AMI BIOS the AI6NL sports does an average job of making the setup process less of a chore, although users of the Award BIOS may find that they are missing the familiar configuration utility. 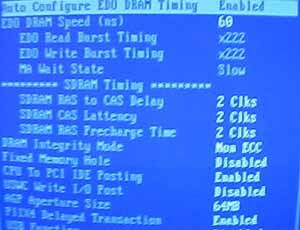 The configurable options in the BIOS are pretty much standard for all LX motherboards, and the AI6NL could be run using the most aggressive BIOS timings without any problems at all regardless of what brand of SDRAM was used, mind you that some cheap generic modules won't be as solid as those that are manufactured with quality/reliability in mind. Windows 95 booted without a problem, the installation of the Intel Bus Master IDE drivers went perfectly fine without a hitch, and Winstone was on its way to running its first test run. 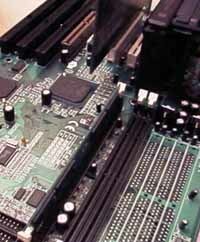 Overall, the performance of the TMC AI6NL can't be beat by any other AT Pentium II LX motherboard, and remains fairly competitive when you place it in the entire Slot-1 arena, taking a back seat to the AOpen AX6L which still stands strong as one of the best overall Pentium II motherboards out today. 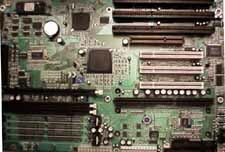 There are a few problems with the TMC AI6NL, however it is a down right decent motherboard.